Ed Huck Marine as well as an increased number of boating enthusiasts attended the 58th Fort Lauderdale International Boat Show. From November 1st – 5th and across 7 locations in Fort Lauderdale, more than 1,400 boats of varying sizes and prices were on display. 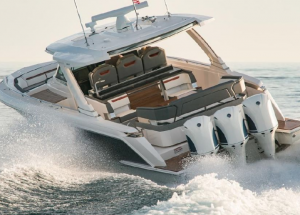 In addition to sunny skies and consumer optimism about the economy, the growing number of visitors showed up to see the huge selection of new boat models. Ed Huck Marine was at the Tiara Yachts booth where the debut of the 2018 Tiara Sport 38 LS received lots of attention and interest. This luxury sport yacht is a fusion of sophistication and performance that surpasses expectations for day yachting.